As an escape from the tourist clogged streets we went to Gaudi’s Park Guell, which is probably the only thing I really liked that we saw by him. It was relaxing, a breath of fresh air, and I could actually feel the architecture, landscape design and nature in dialogue with each other. 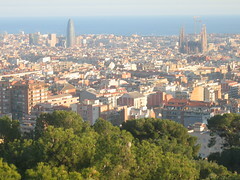 Plus, it afforded a wonderful view of the city and the sea in “magic hour” light. You can see the electric company building and the Sagrada Familia (a Gaudi creation I was “unimpressed” with, or rather, was impressed with its ugliness).